As expected, the New Jersey Transit board of directors has approved a 9 percent fare hike and service cuts, again making transit riders the victims of Governor Chris Christie’s budget shell games. 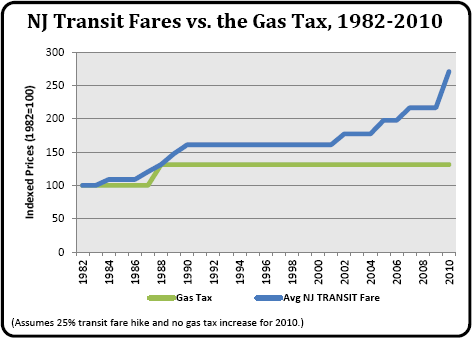 New Jersey’s gas tax is the second lowest in the U.S., and has not seen an increase since 1988. Christie has refused to raise the tax, despite indications of public support, as the state racks up billions in debt. Five years ago Christie killed the long-planned Hudson River ARC transit tunnel so he could fund highways without raising the gas tax. On the other hand, Christie has no qualms with increasing costs for transit users, who last took a hit in 2010, when fares went up 25 percent and 10 percent, respectively, for bus and train riders. Writing for the Tri-State Transportation Campaign’s Mobilizing the Region blog, Janna Chernetz reports from yesterday’s vote to raise fares again, at a meeting where board members talked around the budget disaster caused by Christie and state legislators. Despite pleas from advocates and commuters who oppose the proposal, each and every board member voted to approve the hikes and cuts, validating their vote by saying “their hands were tied” and that they “had no choice.” Vice Chairman Bruce Meisel explained that the board is “operating within the framework of the cards they were dealt” as he justified his affirmative vote. Meisel, posing a rehearsed hypothetical to NJ Transit Executive Director Ronnie Hakim, wondered what would happen if the proposal was voted down. Hakim’s response was substantial service cuts with layoffs approaching 1,000. Absent from the board’s explanation was that the “cards dealt” came from Trenton. There was no mention of the governor’s continued failure to address his state’s transportation troubles. No mention of the legislature’s inaction in helping to prevent the fare increase during budget negotiations. No mention of the decreased direct state subsidy, once as high as $300 million in 2005 and now only $33 million, which landed NJ Transit in this mess to begin with. Elsewhere on the Network today: The Urbanist says pedestrian-oriented commercial zoning in Seattle is working, and Streets.mn finds that — surprise! — new transit projects make a lot more sense than buying everyone a car.